I'm usually not drawn to vans, but there is something oddly cool about this one. 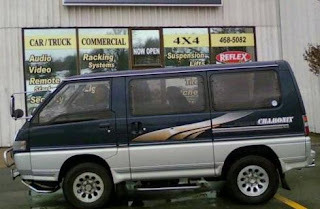 This 4X4 van has a 2.5 liter turbodiesel in it. It would probably be all sorts of fun to take off road, as long as you didn't tip it over. Located in Halifax, NS, Canada, click here to see the eBay listing. Yep, I saw a couple in Colorado too. Not sure how they did it either. 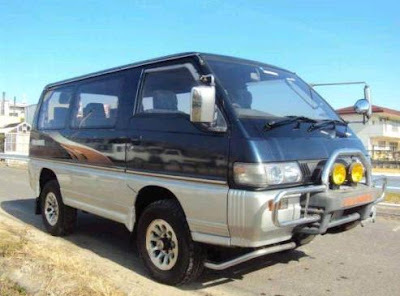 I am currently in Okinawa Japan and these things are all over the place, look monstrous compared to all the small tiny kei cars. About an hour north of Seattle I see one every week. Of course,they are from Vancouver. Right hand drive too. I saw one in California. Let's just say it might have the same VIN as an L300.